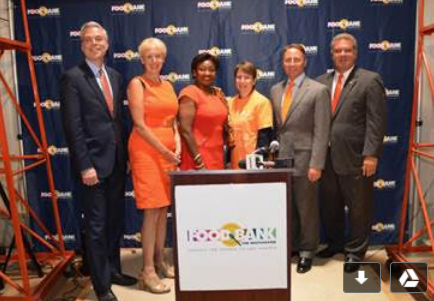 County and city officials, community members, business leaders and supporters -- many wearing orange -- today joined with Food Bank for Westchester to help the county’s leading hunger relief organization kick off Hunger Action Month with the 4th annual “Go Orange to End Hunger” Campaign. Orange is the color for Hunger Action Month in September, which was established by Feeding America in 2008 as a nationwide push to get involved with the hunger crisis across the country. During September, people everywhere from all walks of life help to feed those in need in their neighborhood, working to ensure that people who live with hunger every day can get some relief. Food Bank for Westchester has campaigned Hunger Action Month in the county for several years where 20 percent of the population, or 1 in 5 residents, don’t always know when their next meal will be. Its focus has been on heightening awareness, rallying volunteers, raising funds and driving solutions to end hunger in the county. During today’s press conference, Food Bank announced a month-long calendar of activities around hunger awareness. In addition, government officials and community leaders announced ways they would promote the awareness campaign throughout the month. Food Bank was joined by several local officials and business leaders who came to the press conference to support the campaign, including County Executive Robert P. Astorino, State Senator Andrea Stewart-Cousins, Yonkers Mayor Mike Spano, White Plains Mayor Tom Roach and Marsha Gordon, President and CEO of the Business Council of Westchester. Astorino announced that the county will help promote the campaign on the Westchester County website, social media, e-blast and other promotional platforms. To help spread hunger awareness, Yonkers Mayor Mike Spano announced that he would take on the SNAP Challenge (also known as the Food Stamp Challenge) for one week and encouraged other mayors to do the same. For this challenge, an individual of means chooses to purchase food using only the monetary equivalent of what a family that size would receive in the U.S. federal government Supplemental Nutrition Assistance Program (SNAP), colloquially called food stamps. The challenge is one of the best ways to learn about the nutrition hurdles that low-income Americans face every day. The New York State maximum allotment is $194 per month (some people might get less). That equals out to be about $194 per month, $6.46 a day for three meals, or $2.15 a meal. Additionally, in the spirit of “fun for a cause,” Food Bank for Westchester has partnered with Pace University for its first-ever Miles for Meals 5K Fun Run, which will take place at Pace’s Pleasantville Campus, located at 861 Bedford Road in Pleasantville, at 8:30 a.m. on Saturday, September 9. Also, in recognition of the awareness month, Food Bank will also host its annual Agency Day for all of its partners on September 14 at the DoubleTree by Hilton in Tarrytown. · Yonkers City Hall will be lit up with orange lights. · Business Council of Westchester will make its Finally Friday E-Blast orange on September 8. · Empire City Casino in Yonkers will turn its entrance canopy lights orange. · Cross County Shopping Center in Yonkers will place orange mums throughout the center and will host its annual Fall Flicks event on September 22, 29 and October 6 where Food Bank for Westchester will set up to welcome donations. · The Journal News has chosen Food Bank for Westchester for its benefitting charity of it’s first-ever Food Truck Mash-Up event on September 9. Intoxikate.com has partnered with local restaurants to feature an orange-inspired dish on their menus for a special campaign called Eating Orange. Participating restaurants include: Yonkers Brewing Co., Chutney Masala, Sambal, Cedar Street Grill, Saltaire Oyster Bar, Crabtree Kittle House, Siegel Bros. Marketplace, Alvin & Friends, License 2 Grill, La Bocca, Harper’s Restaurant, Meritage Restaurant, Saint George Bistro, Baked by Susan, Empire City Casino, Chocolations, Rye House, Village Beer Garden, and Savor at The Westchester. · Bow Tie Mount Kisco Cinemas has partnered with Food Bank for Westchester and Mount Kisco Interfaith Food Pantry to show the movie Wasted! The Story of Food Waste on September 10. · PepsiCo will host its “Feed’s America Day” at Food Bank for Westchester on September 14. · Yonkers RiverFest will feature Food Bank for Westchester’s food growing program during its celebration on September 16. · Broken Bow Brewery will host a food and funds drive for Food Bank for Westchester in honor of J.P Woods on September 16. · White Plains Jazz Fest will welcome Food Bank for Westchester’s Empty Bowls event to downtown White Plains on September 17 from noon – 5:30pm. Individuals will be encouraged to purchase an artist-made bowl with soup served by local chefs – all to raise awareness for September’s Hunger Action Month. In addition, all month long, Food Bank for Westchester has partnered with local coffee shops for its Match Your Morning Coffee campaign that encourages people to donate the same amount of money they pay for their coffee for the cause. The organization has also partnered with ice cream shops for its Scoop Out Hunger campaign where the shops will also collect donations. To learn more about Hunger Action Month and for a complete listing of activities, please visit www.foodbankforwestchester.org. From left: White Plains Mayor Tom Roach; Marsha Gordon, President and CEO of The Business Council of Westchester; New York State Senator Andrea Stewart-Cousins; Leslie Gordon, President and CEO of Food Bank for Westchester; Westchester County Executive Robert P. Astorino; and Yonkers Mayor Mike Spano.